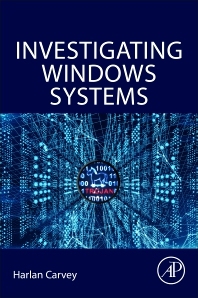 Unlike other books, courses and training that expect an analyst to piece together individual instructions into a cohesive investigation, Investigating Windows Systems provides a walk-through of the analysis process, with descriptions of the thought process and analysis decisions along the way. Investigating Windows Systems will not address topics which have been covered in other books, but will expect the reader to have some ability to discover the detailed usage of tools and to perform their own research. The focus of this volume is to provide a walk-through of the analysis process, with descriptions of the thought process and the analysis decisions made along the way. A must-have guide for those in the field of digital forensic analysis and incident response. Mr. Carvey is a digital forensics and incident response analyst with past experience in vulnerability assessments, as well as some limited pen testing. He conducts research into digital forensic analysis of Window systems, identifying and parsing various digital artifacts from those systems, and has developed several innovative tools and investigative processes specific to the digital forensics analysis field. He is the developer of RegRipper, a widely-used tool for Windows Registry parsing and analysis. Mr. Carvey has developed and taught several courses, including Windows Forensics, Registry, and Timeline Analysis. Excellent Book - Get into the mind of an expert in DFIR! 2. Our industry does not support the leaders in our industry enough. Harlan is a man who speaks what he thinks and backs it up with experience, knowledge, and facts. This is something that I appreciate. Anyone can complain and point out that things are not being done properly or analyzed in the right way, but few can provide clear ideas and opinions on how it should be done that others will less experience can follow. This book is smaller than your typical book in the computer industry, which is a positive. I have read too many monstrous technical books that claim to provide all the answers but are limited on practical details and instead list example after example that may or may not provide insight into real-world issues. Harlan went the opposite direction and wrote a book which provides just the facts and just the information you need to feel more confident in responding to a cyber incident. In the Preface, Harlan starts off by stating “I am not an expert”, but with over 30 years in the information security field, I think it’s safe to say Harlan is being a bit humble. The reality is that he IS an expert and clearly knows what he is talking about when it comes to incident response which is very apparent in this book. For someone like me, that feels overwhelmed at the idea of responding to a cyber incident, getting into the mind of an expert who has dealt with countless cyber incidents is extremely valuable. Each decision is explained and evidence is shown on what step to take next and why to reduce the overall amount of data that you need to process and analyze. His examples flow, allowing you to ‘see’ what Harlan sees as he steps you through the different examples. In my mind, Harlan’s book is a must for folks working in Incident Response. I strongly encourage you to purchase the book so that you can get into Harlan’s head and see why he makes the decisions he makes during an incident response. I started off this review stating that his book is excellent and that we must support Harlan and others like him that give so much to the DFIR community. Training within the DFIR field is expensive and if we hope to have Harlan and others produce books like this, which provide so much useful information at a fraction of formal training costs, then we have to support them by purchasing the book and encouraging others to do the same. I was anxiously awaiting the release of this book, since the summer. I knew I had to have it for one reason - the book's author. I've read Windows Forensic Analysis Toolkit (one of Harlan's other books), and was not disappointed. One section in that book, in particular, appealed to me - the report writing/documentation section. This is an area of digital forensics for which I do not find many resources. So, when I opened Investigating Windows Systems, and realized the content was divided into various scenarios (each scenario was basically written in report-format) my eyes almost popped out of my head (that's a good thing). Harlan provides great perspective on a myriad of topics, and sparks a lot of thought on how an investigation can be handled. It'll also spark thought on other items of interest, based on the reader's experience (I'm sure). One overarching concept I identified in the book was this - a practitioner must give value to findings, by documenting the meaning of particular artifacts, as a function of context (ie given a scenario, an artifact means 'x'; in another scenario, the same artifact still proves 'x', and may prove 'y'. Additionally, the concept of drilling down, and making sense of digital evidence, must be part of a practitioner's feedback (to a prosecutor, client, or student of the trade). Harlan's method of conveying examination/analytical details, makes sense to me, and gives me a rhythm to emulate. Whether in part or in whole, I can use the content of this book as a template, and modify as necessary. As you read Harlan's book (any of them really), you'll notice great value through the explanations he provides. I purchased the electronic version, but wish I had purchased the paper version - this way I could highlight and use sticky-flag, for parts that are of interest to me.